Fibroid Tumor; Laparoscopy; Round Ligaments. Round ligament fibroids are rare tumors and can present as inguinal, adnexal, or vulvar masses. Preoperative diagnosis can be made by ultrasonography or magnetic resonance imaging (MRI). A 28-year-old virgin female presented with pelvic pain that persisted for a few days. Her sonographic evaluation detected a well-defined hyperechoic 45 × 40 mm right adnexal mass interfering endometrioma. A contrast-enhanced pelvic MRI showed a 43 × 39 × 32 mm solid mass located in the right adnexa. Laparoscopic exploration revealed a well-defined double torsion around the peduncle pinky solid mass arising from the right round ligament. The mass was resected with the final histopathological diagnosis being leiomyoma. The diagnosis of round ligament fibroids can be challenging, and laparoscopy is one of the first options where surgical facilities are available. 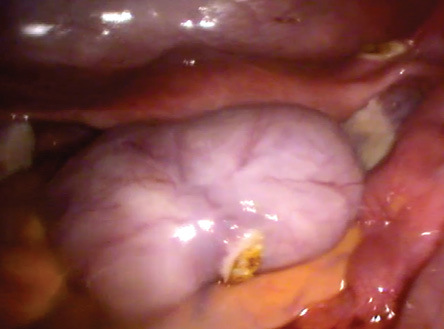 Here, we report a case of a torsioned right round ligament fibroid who presented with pelvic pain and was managed with laparoscopic surgery. Figure 1: Transverse plane of contrast-enhanced pelvic magnetic resonance imaging. A 43 × 39 × 32 mm solid mass located in the right adnexa. Figure 2: The red arrow shows a torsioned solid mass arising from the right round ligament. Figure 3: The mass was resected using a Harmonic scalpel. Figure 4: The final view of the adnexal mass. A 28-year-old virgin female presented to our outpatient unit with pelvic pain that persisted for a few days. She had regular periods, and her medical history was unremarkable. Sonographic evaluation detected a well-defined hyperechoic 45 × 40 mm right adnexal mass interfering with the endometrioma. A contrast-enhanced pelvic MRI scan showed a 43 × 39 × 32 mm solid mass located in the right adnexa [Figure 1]. Preoperative serum CA 125 level was 9 U/mL, and a diagnostic laparoscopy was planned for the adnexal mass. Laparoscopic exploration revealed a normal uterus, with normal ovaries and tubes. A well-defined, double torsion was observed around the peduncle pinky solid mass arising from the right round ligament [Figure 2]. 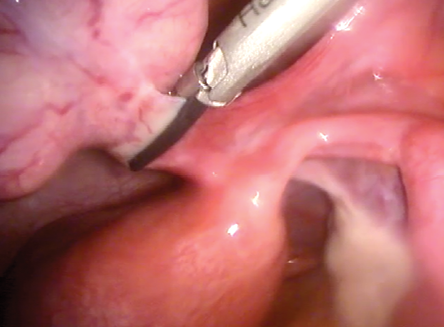 The mass was detorsioned and grasped using endoscopic grasping forceps and resected with a Harmonic scalpel (Ethicon, Cincinnati, OH) [Figure 3 and 4]. The mass was removed from the abdominal cavity, morcellated, and deposited into an endobag. No macroscopic abnormalities were observed on the peritoneal surface or in other abdominal organs. After a nonremarkable postoperative period, she was discharged on her first postoperative day. The final histopathological diagnosis was leiomyoma. The round ligament mainly consists of smooth muscle fibers, connective tissues, vessels, and nerves.5 Uterine fibroids are one of the most common benign gynecological tumors and are derived from smooth muscle fibers.3,6,7 The incidence is approximately 20–25% and has been shown to occur in 77% of hysterectomy specimens.8 These fibroids are mostly located within the uterus but can rarely occur in extrauterine locations such as between the leaf of broad ligament, inguinal region, and round ligament. Round ligament fibroids occur in the extraperitoneal portion of the ligament and are mostly seen to the right of the adnexa for still unknown reasons. These fibroids usually resemble an inguinal hernia, lymphadenopathies, ovarian cysts, and other pelvic masses because of the localization.9 Symptoms depend on the location and size of the tumor. Although the majority of these masses present as asymptomatic, in some cases, the clinical presentations may occur with pelvic pain or a palpable mass.3 In our case, the patient had pelvic pain that was correlated with the torsion of the fibroid around its peduncle. In the present case, preoperative ultrasound diagnosis revealed what was primarily an endometrioma, but after MRI reports determined it to be a solid mass, we performed a diagnostic laparoscopy. The misdiagnosis of round ligament fibroids usually occurs through ultrasound due to its pedunculated nature and its location by the ovary. The diagnosis of round ligament fibroids is challenging. The presentation may be asymptomatic but must be kept in mind in the differential diagnosis of adnexal torsions. Laparoscopy can be the first choice where operation room settings are available. 1. Lösch A, Haider-Angeler MG, Kainz C, Breitenecker G, Lahodny J. Leiomyoma of the round ligament in a postmenopausal woman. Maturitas 1999 Jan;31(2):133-135. 2. Birge O, Arslan D, Kinali E, Bulut B. Round ligament of uterus leiomyoma: an unusual cause of dyspareunia. Case Rep Obstet Gynecol 2015;2015:197842. 3. Ali SM, Malik KA, Al-Qadhi H, Shafiq M. Leiomyoma of the Round Ligament of the Uterus: Case report and review of literature. Sultan Qaboos Univ Med J 2012 Aug;12(3):357-359. 4. Colak E, Ozlem N, Kesmer S, Yildirim K. A rare inguinal mass: Round ligament leiomyoma. Int J Surg Case Rep 2013;4(7):577-578. 5. Warshauer DM, Mandel SR. Leiomyoma of the extraperitoneal round ligament: CT demonstration. Clin Imaging 1999 Nov-Dec;23(6):375-376. 6. Kelly EG, Babiker M, Meshkat B, Beggan C, Leen E, Keeling P. An unusual finding in the inguinal canal of a 26-week pregnant patient. Hernia 2013 Aug;17(4):537-540. 7. Al-Wadaani HA. Anterior abdominal wall leiomyoma arising de novo in a perimenopausal woman. Oman Med J 2012 Jul;27(4):323-325. 8. Downes E, Sikirica V, Gilabert-Estelles J, Bolge SC, Dodd SL, Maroulis C, et al. The burden of uterine fibroids in five European countries. Eur J Obstet Gynecol Reprod Biol 2010 Sep;152(1):96-102. 9. Kan Ö, Sükür YE, Aytac R. Extraperitoneal leiomyoma of the round ligament of the uterus mimicking adnexal mass. J Obstet Gynaecol 2017 Feb;37(2):257-258.